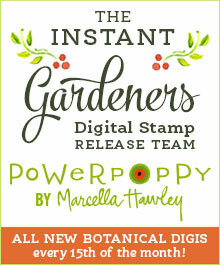 Did you catch the new digital stamp release from Power Poppy? You can bet that I did and that it’s already in my stash ready to be colored! Marcella Hawley’s Partridge in a Pear Tree is a beautiful take on the classic Yuletide carol (maybe we can talk her into drawing the other eleven characters!). The challenge for me was to pick realistic shades for the pears. While I’ve colored lots of flowers, this is my first attempt at fruit and while beautiful to see, pears are not one of my favorites to eat so I don’t pay much attention to them in the store. This is where Google (and Pinterest) is your friend. So after much experimentation, I selected four shades of green (YG11, YG03, YG23, YG17) and three shades of yellow (Y11, Y15, Y38) — a lot to fit on those pears, but plenty of room for shading and color variation. My pears are probably a little brighter than they are in reality, but I wanted them to hold their own against the leaves and ornaments in the tree. Cardstock: Bazzill Basics in Avalanche; Clouds from the Sunny Days Ahead Collection By Echo Park Paper Co. 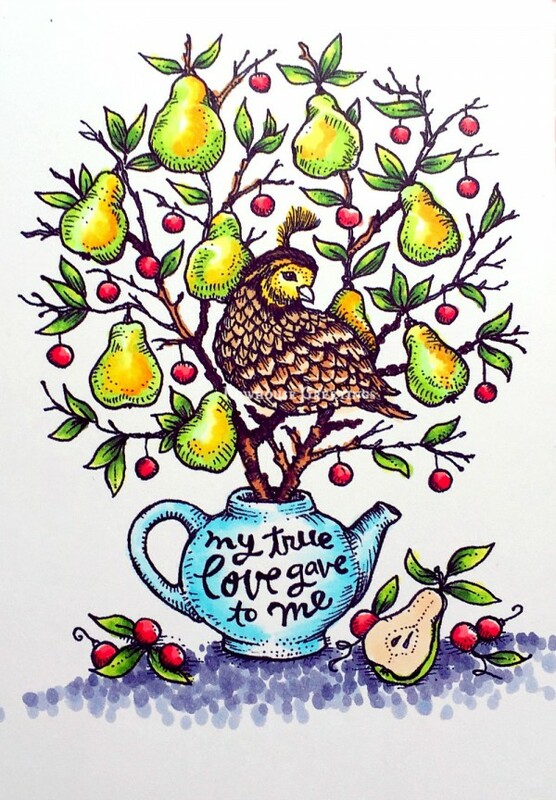 Beautifully done, Nancy, and I love your bright pears! They do pop, and I love the beautiful layout with the DP on both sides. Lovely card inside and out…once again! Hugs!